Funding statement: This study was funded by the Medical Research Council (MR/N028244/2). Self-reported alcohol misuse is high amongst personnel of the United Kingdom (UK) Armed Forces, with the trend continuing after they leave service [1, 5]. More than 50% of those who have left military service meet the criteria for hazardous alcohol use, defined as scoring 8 or more on the Alcohol Use Disorders Identification Test [2, 3]. This prevalence rate is almost double that found in the general population . Most people in the general population underestimate their drinking and do not perceive it as problematic, even when the level of consumption is potentially harmful to health . This pattern is similar among Armed Forces personnel, with less than half of harmful drinkers recognising that they have an alcohol problem . There is a culture of heavy alcohol use in the AF which may be encouraged or maintained by social determinants ; therefore, leaving service could provide an opportunity to initiate change in settings with less peer pressure to conform to social norms. One medium in changing alcohol consumption is using a smartphone application (app). Existing alcohol apps emphasise longer-term health consequences which are seen as remote risks by young drinkers [9, 10, 11], however, a recent meta-analysis suggests that there may be greater benefits to focusing on shorter term consequences in order to encourage individuals to reduce their alcohol consumption [12, 13]. To the authors’ knowledge, we are unaware of any academic studies in this field which have released the source code under Open Source Initiative approved licenses to encourage reuse . The app should be compatible across modern (released after 2012) Android (Google Inc, Mountain View, California, United States) and iOS (Apple Inc, Cupertino, California, United States) operating systems. The app should be capable of storing data locally and make it retrievable as required by the app. The app should allow users to self-report and record a range of alcoholic drinks (including quantity, who with and where) and offer the ability of recording a ‘Drink Free Day’. The app should be able to collect a range of self-reported measures obtained via in-app questionnaires. The system should provide a simple registration and signup process with minimal data collection. Example screenshots captured from the InDEx app. The objective of this paper is to describe the development of the app. It will provide the research community with an exemplar app for use in other studies, and highlight the key stages to development. InDEx used Agile development methodologies , with each cycle focusing firstly on the development and secondly on stakeholder/expert user testing (as illustrated in Figure 2). An incremental approach was employed, where each cycle built upon the functionality of the previous with new functionality introduced based on stakeholder/export user feedback. The cycle would not progress until stakeholder feedback on core features had been addressed. 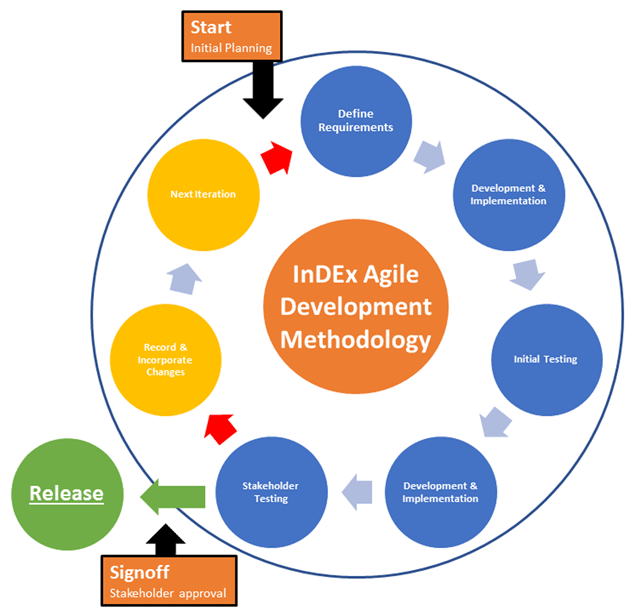 The Agile development methodology employed during development of the InDEx app. Screening and Normative Feedback: This module consists of two elements. First, at specific periods during the app life-cycle (e.g. day 0, 7, 14, 21 and 28) users are presented with a set of questionnaires (defined by the research team) and responses are logged (screening.js [state: screening]). Secondly, questionnaire responses are analysed to produce an informative visual feedback on alcohol consumption (normative.js [state: normative]). Alcohol Reporting and Monitoring: This module consists of two elements. First, users are able to log alcohol consumption and ‘Drink Free Days’ (addDrink.js [state: adddrink]). Optional consent is available to obtain GPS location (geolocation.factory.js). Further, users can optionally record information on who they are with and where they are drinking. Second, a range of metrics are generated to provide an overview of current consumption (normative.controller.js [state: tabs/normative]). Goals: This module enables users to set goal(s) based on implementation intentions ; a methodology that empowers the user to form self-regulation strategies in the form of an if-then plan. Users can select a goal (goals.js [state: tabs/goals]) and identify what is the biggest barrier to achieving that goal, Table 1 illustrates goal setting with if-then. Visual feedback is provided to users on progress towards achieving goal(s) and a status on those that have expired. Example implementation intension goals for InDEx app. I want to drink less overall this week If I’m spending time with friends who drink a lot then I will start with water or a soft drink. Account Management: This module (account.js [state: tabs/account]) enables users to modify and review personal information (e.g. first name, last name, mobile number), password and app parameters (e.g. automatic log out). The software is implemented using Drifty Co (Madison, Wisconsin, United States) IONIC Framework version 1, which is a cross-platform framework for web and mobile apps. The software has been implemented as a standalone application and does not require connection to a central service. All functions have been individually tested for correctness to ensure their correct behaviour. Furthermore, all versions of the software underwent rigorous testing by stakeholder/expert users sourced from King’s Centre for Military Health Research and University of Liverpool (n = 17) to ensure software quality and usability. Development: Windows 7 or above. Mac OS X El Capitan or above. Production: Compatible on iOS and Android operating systems released after 2012. None beyond requirements of the operating system and dependencies (listed hereafter). IONIC Framework version 1 (tested v3.0.0) . All other dependencies are stated within the source code and accessed via a Content Delivery Network (CDN). This list of authors includes all main contributors. Daniel Leightley led the software development and is its current maintainer. InDEx (v1.0.0) enables research rapid access and reuse to an exemplar smartphone app for use in alcohol research, but provides the facility to modify the software for uses in other domains. The software has been made freely available to the community to further develop, extend and contribute to the app ecosystem. The GNU General Public License (v3) has been selected to ensure that developments are shared with the community, to the benefit of the community. Support for modifying and using the software is available through GitHub issues page (https://github.com/DrDanL/index-app-public/issues) and GitHub wiki (https://github.com/DrDanL/index-app-public/wiki). The authors would like to thank Zoe Chui, Matt Field, Colin Drummond, Toktam Mahmoodi, Norman Jones and Margaret Jones for their contributions to the inception and overall progress of this project. McManus, S, Bebbington, P, Jenkins, R and Brugha, T 2014 “Mental Health and Wellbeing in England: Adult Psychiatric Morbidity Survey 2014.” Leeds. Weaver, E R, Horyniak, D R, BiomedSci, B, Jenkinson, R, Dietze, P and Lim, M S C 2013 “‘Let’s get Wasted!’ and Other Apps: Characteristics, Acceptability, and Use of Alcohol-Related Smartphone Applications.” JMIR Mhealth Uhealth, 1(1): e9. Initiative, O, Open, T and Definition, S 2004 “Open source initiative.” At http://www.opensource.org/index.html Accessed [Online]. Available: https://opensource.org/ [Accessed: 08-Nov-2017]. Clinton, K 2008 “An agile Retrospective.” [Online]. Available: http://www.clintonkeith.com/resources/GDC2008-AnAgileRetrospective.pdf [Accessed: 06-Nov-2017]. Gollwitzer, P M and Sheeran, P 2006 “Implementation Intentions and Goal Achievement: A Meta-analysis of Effects and Processes.” Advances in Experimental Social Psychology, 38: 69–119. Academic Press. 01-Jan-2006. Drifty Co 2013 “Ionic Framework.” [Online]. Available: http://ionicframework.com/ [Accessed: 10-Nov-2017].